You know all I really want to do right now is scream OMG SPRINKLES and be done. Right? My inner five year old is flipping. Pink plus sprinkles plus ice cream plus chocolate plus CROISSANTS. Dead, I tell you. Dead. I’ve had a special place in my heart for croissants since I was super young (like under the age of ten) because my grandma would always get me one from the Bread Box bakery in Boyne City. She created a monster, really. Flakey, buttery layers? Sign me up. Oh oh – and a few years ago I actually MADE croissants (you can see the step by step pics here) and they are truly one of the few things that I HAD to remove from my home. Because I couldn’t stop eating them. Like they were so insanely delicious that I just could.not.stop. I didn’t really think that croissants could get any better (well, aside from the occasional stuffing with chocolate thing) but… I was wrong. Because apparently you can fry them in butter. And make them crispy. I feel like this is almost like that horrific deep fried butter on a stick that you occasionally hear about on the news every summer, but no where near as scary. If you’re not exactly sure how much butter goes into an actual croissant, let’s just leave it at “oodles.” A lot of butter. All the butter. Crisping these things up? UGH. So freaking good. And then covering their warm crispiness with melty vanilla ice cream and boozy hot fudge and stuff. My giddiness was out of control. Even I don’t fully understand how color and overwhelming girly junk can get me so wound up. I’m like ten seconds away from decorating my kitchen in a sprinkle theme. The story of how this sundae came about is actually rather embarrassing. Um. So you know I like old people music. Like, a lot. And in December, we happened to be in New York City and just happened to find ourselves in the Carlyle hotel and just happened to find ourselves seeing Steve Tyrell perform. Because we are obsessed. Note: the only other people that I know who are obsessed are my parents. Even better: the only other people who were in the room with us while he was performing were older than my parents. True story. It was wonderful though. It was like listening to all the music from Father of the Bride, but LIVE. I don’t really love concerts (in addition to my taste in music, I have old person ears) but I can get down with this sort of thing. Are we still friends? Probably not due to my elderly ways. The point is that we had a dessert there that consisted of a crispy croissant and ice cream. It wasn’t a sundae but I think they called it a sundae but it was served on a plate and who can serve an actual sundae ON A PLATE? No. Hence the bowls. I don’t really remember what was going on but I remember crispy croissants. The most important part. If you’re not feeling everything red velvet and heart shaped, these little sundaes will do the trick. If you can’t wait for the day to be over, eat this for lunch. And maybe hot fudge milkshakes for dinner. You deserve it! Even if makes you feel like a kid again. Add the cream and wine to a saucepan and heat over medium heat. Cook until the liquid is warm and there are bubble forming on the edges of the pot. Stir in the sugar until it is totally dissolved and allow the mixture to come to a boil. Once boiling, reduce the heat to low and stir in the butter until melted. 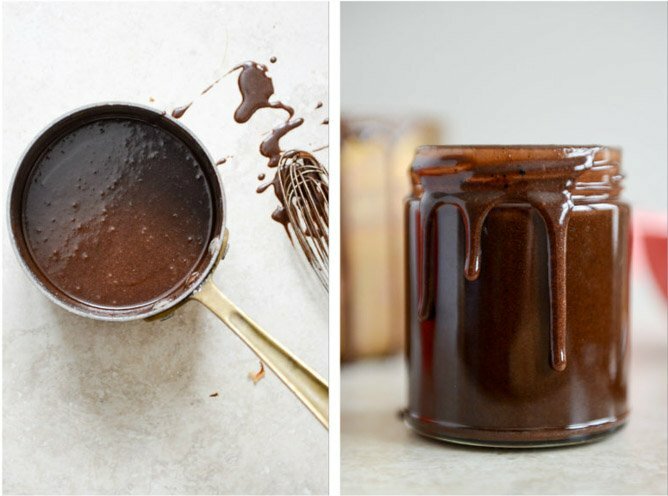 Turn off the heat and add in the chocolate, allowing it to sit for a minute. Then stir constantly until the chocolate is completely melted. Stir in the vanilla extract and salt. I like to let this sit for a while at room temperature to thicken even more. To crisp the croissants, heat a large skillet over medium-high heat and add olive oil and butter. Add the croissants to the skillet and cook on both sides until golden and crispy, about 1-2 minutes per side. Remove and let sit on a paper towel to drain a bit. 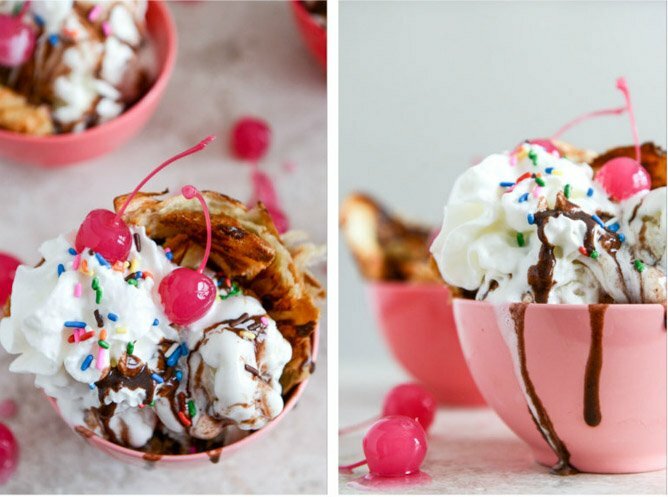 Place the croissants in a bowl (break them apart if you’d like) and assemble the sundaes with the ice cream, whipped cream, fudge sauce and sprinkles! bite size sundaes! I can die happy. Real Life Wednesday: I’m So Over You, Winter.